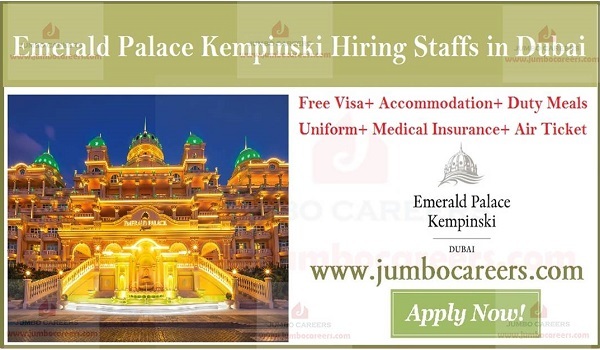 German based Kempinski Hotel Group hiring staff for 5 star hotel in Dubai: Emerald Palace Kempinski, Dubai. Its the latest free and direct recruitment by Kempinski Hotel Group in Dubai for Emerald Palace Kempinski, Dubai. About Kempinski Hotel Group :Kempinski Hotels currently operates 75 five-star hotels and residences in 30 countries. Starting in Germany, over the years Kempinski has extended its hotel portfolio to other parts of Europe and to the Middle East, Africa, Asia and Latin America. About Emerald Palace Kempinski Dubai: An impressive 100,000 square meters, the Emerald Palace Kempinski Dubai comprises 347 luxuriously appointed rooms, of which 36 are exquisitely spacious suites. Surrounded by pristinely landscaped tropical gardens are eight highly appointed royal villas with stunning views of the Palm Lagoon. Experience : 2 years hospitality experience in Digital Marketing & Social Media. Core Skills : Website, PPC, SEO, SEM etc.